Virtually every manufacturing company has plans for an automated "factory of the future." 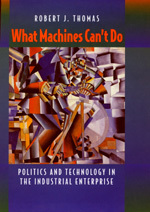 But Robert J. Thomas argues that smart machines may not hold the key to an industrial renaissance. In this provocative and enlightening book, he takes us inside four successful manufacturing enterprises to reveal the social and political dynamics that are an integral part of new production technology. His interviews with nearly 300 individuals, from top corporate executives to engineers to workers and union representatives, give his study particular credibility and offer surprising insights into the organizational power struggles that determine the form and performance of new technologies. Robert J. Thomas is Professor of Organizational Studies at the Massachusetts Institute of Technology. He is the author of Citizenship, Gender, and Work: Social Organization of Industrial Agriculture (California, 1985).